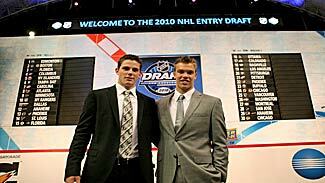 A large group roared at the Staples Center in Los Angeles when Austin Watson was taken by the Nashville Predators with the 18th pick at the 2010 Entry Draft. Watson, a 6-foot-3 forward, is the oldest of nine children and that number is about to change, as his mother is expecting No. 10. "It's pretty crazy … there's never a dull moment around the house," Watson said during a conference call Friday night. "Everybody's running around and doing their own thing. But it's definitely great. To have them all here for the Draft, it was an unbelievable experience for them. They've been so big in my hockey career. For them to be able to come out here and share it with me, it's definitely great." A native of Ann Arbor, Mich., Watson split the 2009-10 season between the Windsor Spitfires and the Peterborough Petes of the Ontario Hockey League. In 52 games, the 18-year-old had 20 goals, 34 assists and 54 penalty minutes. After making his selection, Predators GM David Poile compared Watson to Vancouver Canucks forward Ryan Kesler, a finalist this year for the Selke Trophy as the NHL's top defensive forward. "This was one of two guys that we were really looking at," Poile said. "We're very, very happy to get him. He's certainly a Predators' type of player. He gives it every night. He puts it on the line. He does all the little things that help your team win. He has leadership qualities. He just feels like a really good fit. We're trying to get a little bit bigger. We think he's going to get bigger and fill out and we certainly like that." Watson was drafted right around where he figured. Naturally, he breathed a sigh of relief when the Predators made their selection and then proceeded to hug each of his 11 immediate family members, with the exception, of course, of the one still in the womb. "I thought anywhere from 12-20 was the consensus," Watson said. "It was kind of tough because I didn't know where it would be. When I heard my name called, I was overjoyed. I'm real excited now." Watson turned down a crack at winning the Memorial Cup with Windsor when he agreed to waive his no-trade clause and accepted a deal to Peterborough. It turned out to be a blessing, as Watson received added playing time and the ability to work on all facets of his game. "It was a tough decision to leave a place that had been my home for a year and a half, but at the same time I thought it was something that was necessary to continue my hockey career," Watson said. "I think it worked out pretty well." While Watson was a player Poile had targeted at the start of the night, he wasn't anticipating what turned out to be a bizarre first round. Highly regarded defensemen Cam Fowler and Brandon Gormley, who were both projected to be taken in the top five, slipped to 12 and 13, respectively. Poile admitted he was eyeing both defensemen as each passing team opted to decline. "Very surprised," Poile said. "It's a very good draft. Everybody seems to be pleased. We were favoring taking a forward more than a defenseman. From the outside looking in, we felt that teams that got some of these defensemen later in the first round really got a good bang for their position. "Our list was not long," he added. "We didn't have 18 guys rated. This was one of our highest-rated players. Most of our players went in the first 10. None of these top-end defensemen were getting taken and in the back of my mind I was thinking, 'This is what the fans don't want to hear, we get up there and draft another defenseman.' But there was some really good defensemen that went later than they should of. But we got the guy that we wanted and needed."